8:45 a.m. - I left home in dense fog, tempearture 54F, dying thunderstorms moving in. We were already under a Severe thunderstorm watch until 11 a.m. 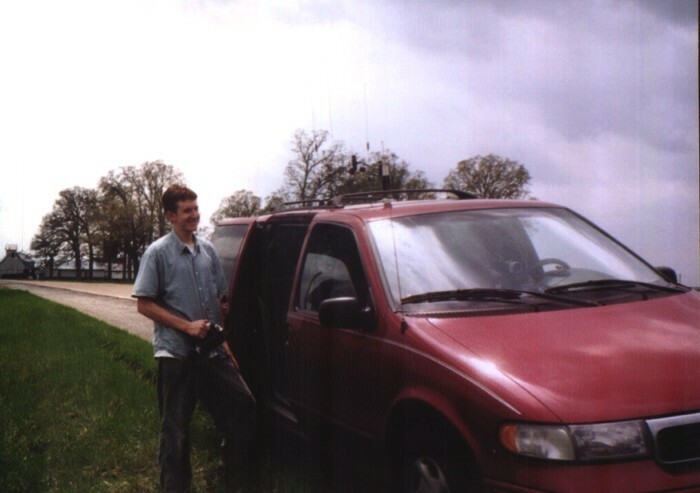 I stayed on the leading edge of the storms, in fog, as I headed SE on IL 143 and S on IL 4 through Lebanon to I-64. 10:30 a.m. - I stop for a while in Mt. Vernon. Temp 75, dewpoint 63. I broke out of the fog east of Okawville around 10 or shortly after. I watch an outflow boundary from the earlier convection move over; wind shifts from S to WNW, and a line of elevated TCU passes over. I get Chris Novy, who is with Mark Siefried and Scott Kampas in Nashville, IL on the phone. They are sticking there for a while and getting data. 11:20 a.m. - I'm at the Belle Rive exit of I-64 after some back road wandering. I'll stay in this general area a couple hours. At 11:20 it is good and juicy - 75 over 68. Wind is SW 10-15 (measured), sky 50-60 percent overcast. A new Severe thunderstorm watch is now in effect until 4 p.m.
11:30 - I talk to Chris again. He advises me the outflow boundary has moved SE to a line from where I-64 enters Indiana from Illinois to near Cape Girardeu, MO. Warm front is just north of I-64. Temp has risen to 70 in Nashville. Clearly we are getting good warm air advection. 12:15 - It's now 80 over 68 at my location. 1:00 - Chris's group and Blake Naftel arrive in two cars. We continue to get data and watch the sky for perhaps half an hour. Warm front is not making much further progress north; lots of isloated but weak cells are forming, some in broken lines, to our SE. Stronger storms are along the cold front southwest of St. Louis, but they are far off and we are concerned they may just form a squall line. Around 1:30, we see hard towers to NE and pick up isolated strong cell on radar, and decide to move toward it. Around 2:00 - We are at the U.S. 45 exit on I-64 near Mill Shoals in Wayne county. The storm we had been making a move toward now looks less impressive. However, in rapid succession, SPC has issued a Mesoscale discussion indicating upgrade to tornado watch likely, then issues Tornado watch. At this location we are joined by prospective ILCHASE member Lee Allen. Poor data connections and debate about which way to go lead to a decision to move back to our earlier location near Belle Rive. Around 2:30 - Back in the Belle Rive area, we stop at a gravel parking lot south of town. We have heard a SVR warning for Randolph Co., and reports of intense storms near Sparta. Shortly before 3, a new SVR warning goes up for Perry Co., and we decide to target that storm. But we need to go south - where we are we will be in the core. We work our way SW on back roads toward Rend Lake. Around 3:40 - After a few wrong turns and one road that dead ended in a cornfield, our 4-car carvan pokes through the SE edge of the storm and arrives at I-57, at the Ina exit. Radar shows strong rotation in the intense storm just to our west, and we see a wall cloud in the distant SW. Chris determines we have time to cross ahead of it, and we blast south to the Benton exit on I-57. 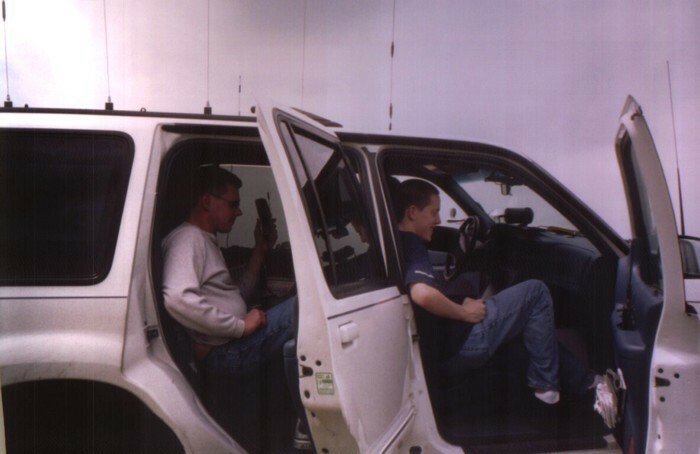 We, or I, anyway, did not know it (the NWR station I was listening to missed this one) but a TOR warning had been issued for our location in northern Franklin Co. I did hear a SVR warning for the same area, as well as for one county to the north. 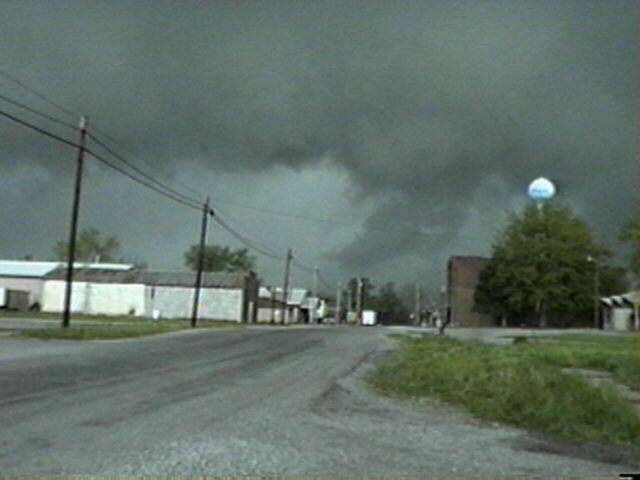 The latter was for the storm that would later produce the deadly Wayne County F3 tornado. As we worked our way through Benton, a spectacular beavertail and wall cloud could be seen just to the northwest of town, moving over the area we had just passed through. Here is a video capture taken on the fly as I stuck the camera out the window in Benton. Around 4:00 p.m. - A couple miles east of Benton on IL 34, we found a place to stop and view the massive wall cloud (video capture). Note the impressive beavertail on the right. 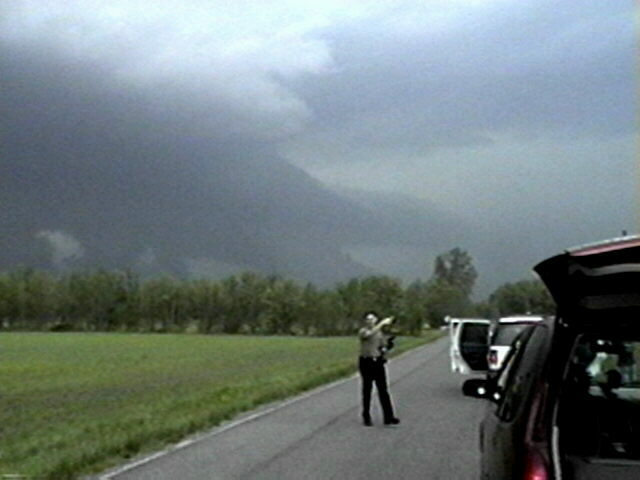 Here is another wall cloud video capture, including Chris Novy giving us directions to a road that would take us east to pursue the storm. As we blasted east, with the storm starting to get ahead of us, I stuck my camera out the window and aimed it at the wall cloud. I was fortunate indeed to get this picture, in the exact same spot where Chris did the same with his video camera. 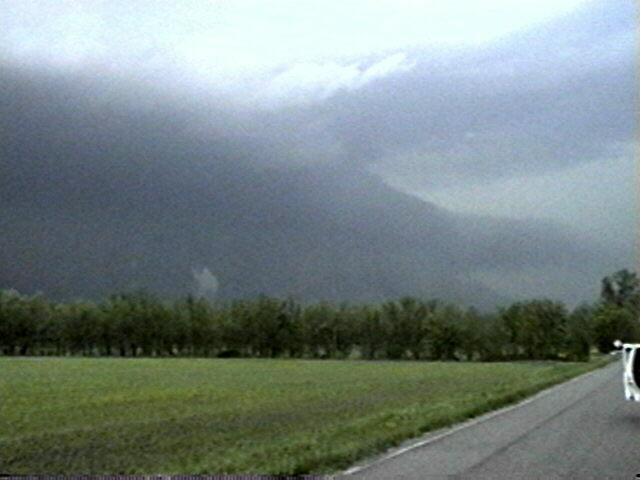 In this picture, the inflow tail cloud on the lower right of the wall cloud goes nearly to the ground. Shortly after this, we tried to turn north, but were blasted by intense wrapping rain and wind. U-turn time. This repeated a couple times, as our efforts to get any closer were to no avail due to the rapid movement and wrapping precip. Finally I broke off, waving to Blake and Lee as they passed to signal my attention, but in the heat of the chase they did not see me. It had become evident that there was no hope of catching up to the storm which was ahead of us and moving at 50 mph, and new storms were intensifying down the line to the WSW. Around this time, NWS PAH issued another TOR warning on our storm. 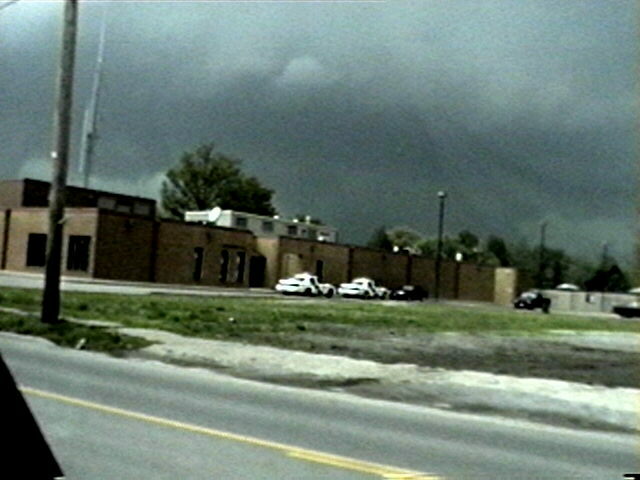 This may have been done partly in response to Chris's reports of the wall cloud; strong rotation was also seen on radar. Around 4:30 - I work my way to the south and west to 34 and head to Tompsonville. There, I hear a new SVR warning for the trailing storm, now reported over Benton. I wait in the Thompsonville area for the storm to pass, and get a video capture of this scuddy lowering as the storm passes. This may be the same feature Chris, Mark, and Scott videotaped a little later farther east. This storm was definitely outflow dominant as it passed my position, though it did look intense. Enough so for another SVR warning to be issued for counties to the east. Around this time, SPC issues a mesoscale discussion based primarily on the supercell we had been chasing and the next one north, which produced the deadly Wayne County F3 tornado. 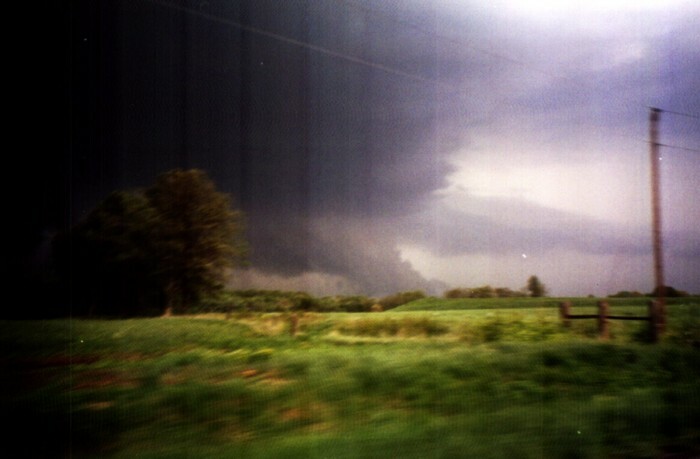 After the second storm passed Thompsonville, I called it a day and started back. It was obvious a lot of rain had come down in these storms; fields were flooded and there was continuous ponding on the road. I stopped for gas in Okawville and noticed a tire was low; this became the first of several air stops the remainder of the way home. I had picked up a nail on one of those back roads; luckily the leak was slow enough for me to get home and leave the car at Dobbs tire, where the tire went flat overnight. As indicated on my WX-CHASE post, the strangest thing about this is that overnight a 4-foot blue racer snake found its way under my hood and gave the tire guys quite a surprise the next morning. Our storm continued east into SW Indiana, where it prompted 2 more tornado warnings (TOR 3) and (TOR 4). This is another in a series of recent cases where most or all of the chasers were on a storm one south of the one that produced a tornado. In this case, the next storm north produced a long-track F3 tornado (path length 30 miles, width 500 yards) that unfortunately resulted in 2002's first tornado fatality and widespread devastation in Wayne County. Although I do think these recent cases call into question the conventional wisdom that the southernmost storm is best and will cut off the inflow of a storm just to the north, I have no regrets on our decisions. The storm we went after looked the best when we were making our decisions, and indeed it was an awesome storm. This was my second good chase in 3 days; can't ask for much more than that. Here are the local storm reports from our storm, as well as the first report of the tornado on the next storm north. Here are some additional local storm reports, mostly on this storm, from the Paducah NWS office. Here is a NEXRAD radar image from Paducah around 4 p.m. Our storm is the one with the ^ symbol underneath; the storm directly north of it is the one that produced the Wayne County tornado. At this time our storm appears stronger than the one to the north and has a hook echo, but soon the northern storm produced a long-track F3 tornado. Total chase distance: about 300 miles.